No matter how organized or on top of things I try to stay, I still cannot keep up with the laundry. Just when I think I’m done and can pat myself on the back for crossing a big item off my to-do list, more clothes pile up in the hampers. Someone will drop their piece of peanut butter and jelly toast on their shirt or I’ll be brushing my teeth too vigorously and drip toothpaste on my top. We’ve all been there at some point. What helps make the job easier is having the right tools in my laundry arsenal. 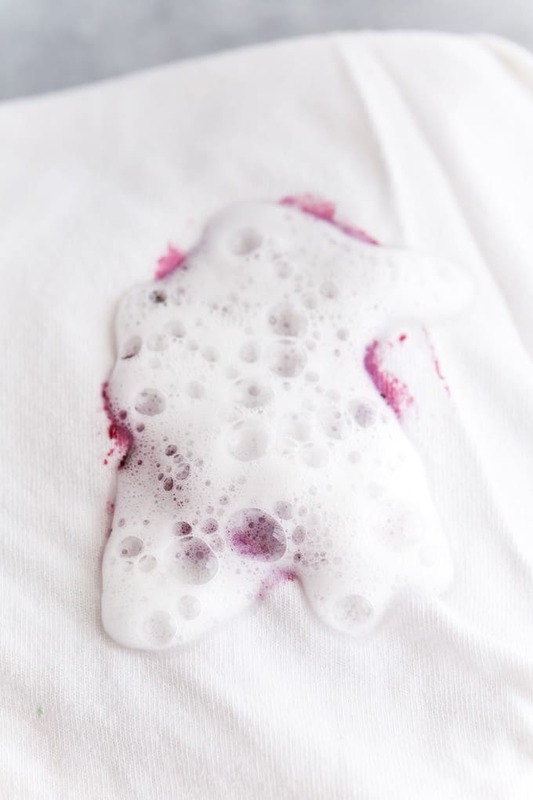 You’ll want products that make your clothes look, feel and smell clean and also have some serious stain fighting power. Take your laundry to the Next Level Clean with OxiClean’s new line up of laundry products. I tried them and they mean business! 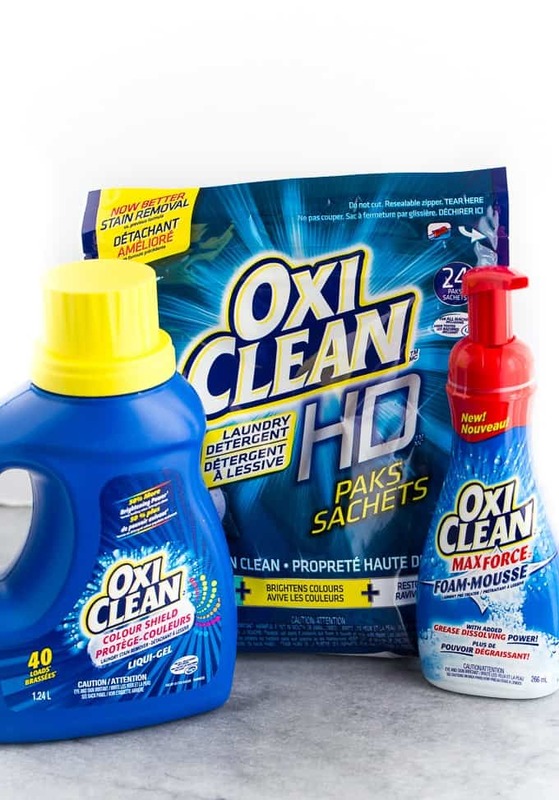 Pick up these three products next time you are doing your shopping: OxiClean™ Colour Shield Laundry Stain Remover, OxiClean™ MaxForce™ Foam Laundry Pre-Treater and OxiClean™ HD Laundry Detergent. 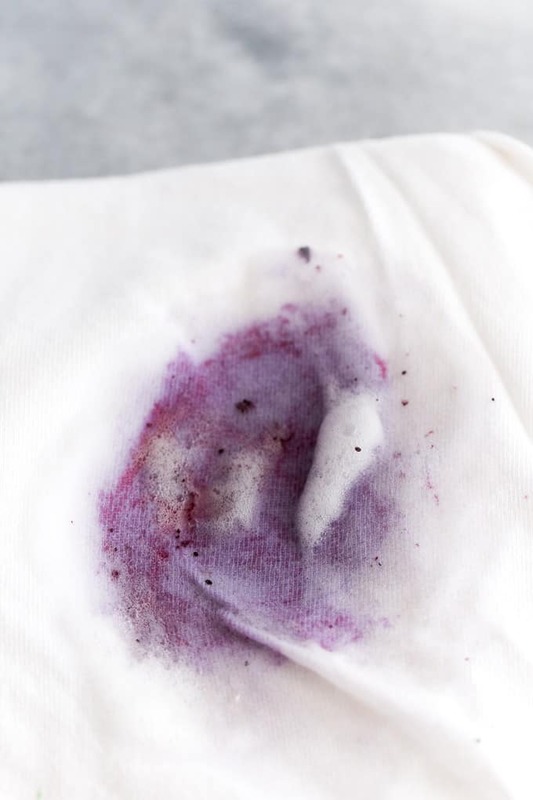 I put them to the test on this blueberry jam stain on one of my white pajama tops. Why do I always spill or drop things on myself whenever I wear white?! I pumped some OxiClean™ MaxForce™ Foam Laundry Pre-Treater directly onto the stain. The foaming action started to work right away to deeply penetrate the fibers and break the stain bonds. I planned to wash the shirt right away, but I could have left it to wash later. You can apply the product to the stain up to seven days before washing. Treat now, wash later. OxiClean™ Colour Shield Laundry Stain Remover is another stain fighting product that keeps your colours looking new and brighter longer. You can use it on every load if you like. It offers 50% more brightening power than the leading value detergent alone. 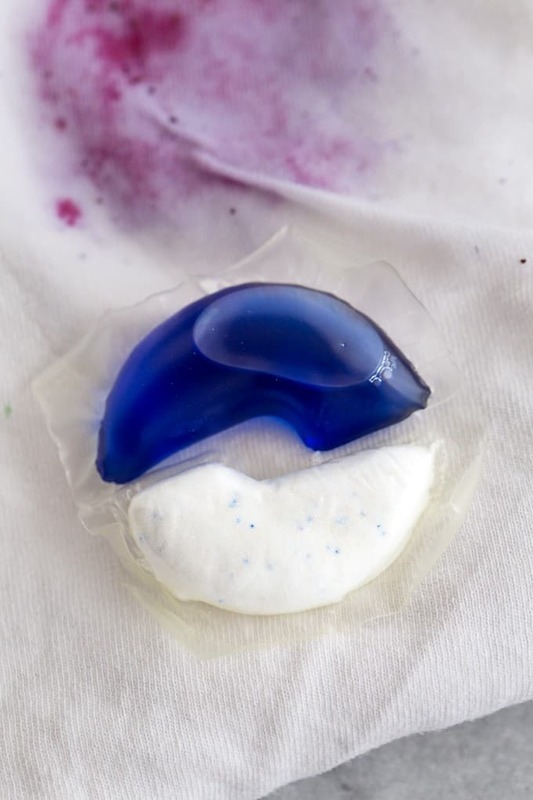 Use it to pretreat stains or simply add into the washer when you add in your detergent. For my detergent, I used OxiClean™ HD Laundry Detergent with its high definition clean and stain fighting power. With three products tackling the stain, it didn’t stand a chance! After coming out of the dryer, the stain was no where in sight. My clothes smelled clean and looked vibrant. You’d never know that I had a jam mishap when you look at this shirt. Stains happen. I expect I’ll be getting a ton of use from the OxiClean™ MaxForce™ Foam Laundry Pre-Treater. Oh look! I spilled some coffee on myself as I was writing this post. I guess you know what I’ll be doing tonight! Visit OxiClean to learn more about their new laundry products and connect with them on Facebook for product news and updates. 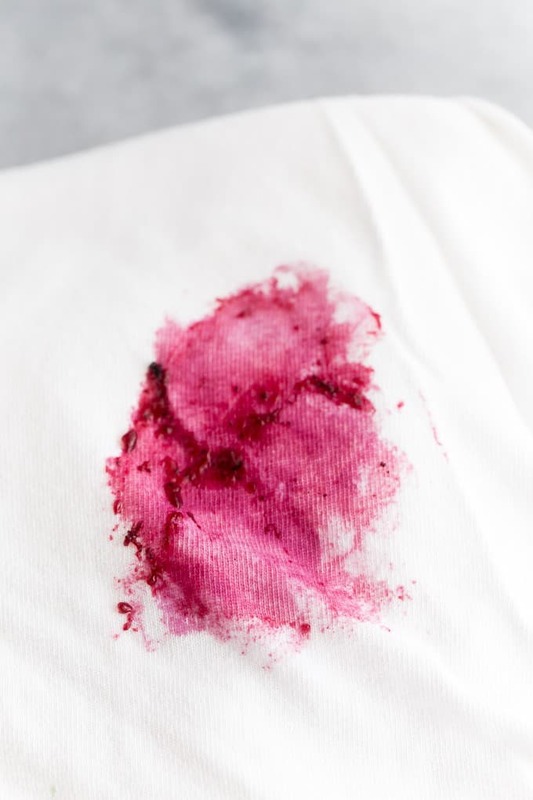 What was the toughest stain you ever had to deal with? I always have a tough time getting rid of bacon grease splatters! Tomato stains are the hardest! Blueberry juice is the worst! There was never just the one stain, but I constantly deal with blood and sweat stains on my workout clothes due to sparring and MMA. Blood stain on the beige carpet! My grand daughter constantly gets stains on her clothes and Oxyclean has been a god send! My daughter works in a kitchen and the oil stains are ridiculous. The toughest stain I’ve ever had to deal with is a large oil splatter stain on a shirt. It’s anything my daughter comes home with, but mostly mud mixed with grass. I’ve had to get out pasta sauce. Usually it comes out! My toughest stain with grass stain on a white baseball pants. The toughest stains are grease from fast food, so hard to get out!!!! Toughest stain I ever deal with is mustard. It;s really hard to get out oil stains.